German Chancellor Angela Merkel maybe be trying her utmost to keep Greece in the euro, but a high school teacher from Bavaria may have found a better solution and is pitching the idea to Greek politicians. Economics teacher, Christian Gelleri, started a local currency in 2003 with his students in the small town of Prien am Chiemsee, around 50 miles south of Munich. The currency has performed so well that on Wednesday he was invited to travel to the Greek region of Macedonia to show local politicians how it could keep them from leaving the euro. His idea doesn’t stop at Greece and he believes it could prevent the euro zone break up in the long run. The idea is called “express money” that would be issued by governments. It would have fast circulation with a 2 percent levy for hoarding notes with a 10 percent charge for conversion into euros. A supporting document co-written by Gelleri reminds readers that doubling monetary velocity, doubles gross national product. He recommends a complementary currency on a national level in Greece and even if they did break from the euro, he believes that local currencies could be used alongside the drachma to strengthen poorer areas. And Gelleri has plenty of experience, the currency he created — the Chiemgauer — will celebrate its 10-year jubilee next year. “With a turnover of 6 million euros last year and a growth rate of 20 percent we see a continuous and very positive development,” he said. The amount of local currencies across Europe has now reached 104, all of which are listed on complementarycurrency.org. 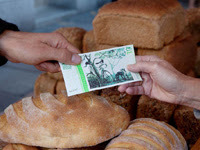 Last week Bristol, a city in southwest England, launched the latest of these — the Bristol Pound. The project is backed by the Bristol Pound Community Interest Company who initially set the exchange rate which is simply one-to-one with the pound sterling. A secure printing firm creates the notes, seven main outlets then issues them and 350 independently owned businesses in the region will be accepting them in the coming weeks. They hope 1000 businesses will sign up to the scheme by the end of the first year. A business consultant who lives in the area, Ross Parker, isn’t so keen on the idea saying it won’t change people’s spending habits or the amount of money they have. Dr Gill Seyfang, an academic from the University of East Anglia in the U.K., who lectures on sustainable consumption, has a more positive outlook for the Bristol Pound. She sees it as being more professionally-organized, more useful and better marketed than previous attempts. There’s a clear reason why these local currencies are appearing according to Seyfang. “As people find that more of their needs are simply not met by national (and international) currencies, then naturally people look to new, innovative financial solutions,” she told CNBC.com. “These initiatives always spring up in times of economic recession,” she said, citing the “stamp scrip” that begun in the American state of Iowa during the 1930s Great Depression.